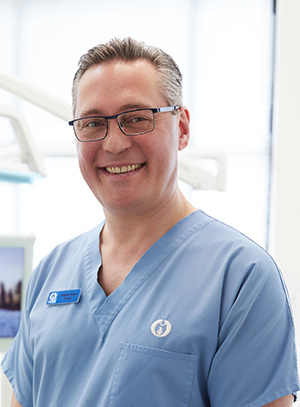 Dr Alistair has over 27 years in the dental industry so far, after graduating with a Bachelor of Dental Science from Glasgow University in 1990. He joined Dental Health Care Associates’s original practice back in the year 2000, and enjoys the many, long-term relationships he has built with patients during this time. Dr Alistair has a holistic approach to dentistry, choosing to concentrate on all of the elements that make up an individual’s oral health – not just their teeth. This thorough approach, combined with his focus on preventative care, has helped Dental Health Care Associates to continually maintain the exceptionally high reputation it has earned. As such, patients from near and far travel to our premises to enjoy the impeccable quality of care Dr Alistair provides. He is continuously involved in professional development and education, with a special interest in endodontics, general restorative dentistry, and cosmetic solutions. Additionally, Dr Alistair has undertaken further training in both the surgical placement and restoration of dental implants, along with temporo-mandibular joint (TMJ) disorders and the treatment of sleep disordered breathing. Want to schedule an appointment with a member of our friendly team? Please contact Dental Health Care Associates today on 03 9650 2909.